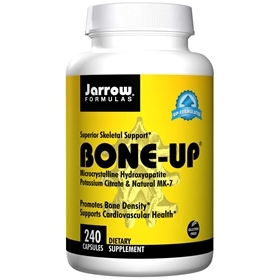 Bone-Up is always UP-FORMULATED to include the latest breakthroughs in bone health. BONE-UP provides ossein hydroxyapatite complex (OHC) (fromfree-range Australian/New Zealand calves), which includes the superior combination of the inorganic calcium lattice of microcrystalline hydroxyapatite (MCHA) within an organic protein milieu rich in naturally occurring growth factors. The OHC is combined with vitamin D3 and vitamin K2 as MK-7 (a more bioavailable form of vitamin K) to support the deposition of calcium into the bones as well as to assist in building up the organic bone matrix. Potassium citrate is also added for optimal osteo support. Take 3 capsules twice per day with meals, preferably dividing the number of capsules equally with each meal (for a total of 6) to facilitate maximum absorption or as directed by your qualified health care consultant. Magnesium stearate (vegetable source) and silicon dioxide. Capsule consists of gelatin. Mineral amounts are elemental. my functional medicine doctor really know vitamins, and he says this is the most complete calcium formula you can find. i have used it for years, and my bone density is great for 64.
best calcium product on the market, with the right vit K and D, along with calcium and magnesium.